Time management, time management. This has to deal with putting everything together. How do you actually write now that you have the skills? You're writing your sentences fine. What should you actually do? So you'll notice here, it says, "Approach 1." Well, there's gonna be a couple of approaches here. How to write an essay that's best for you. So let's go through this approach, and let's see if this will maybe help you out. First off, the most important thing, brainstorm and outline. This is so important. Do not just write. Do not just write. I'm actually going to write that down because it's so important. That is, do not read the prompt and say, "Oh, I get it. I'm going to write. Type, type, type, type. Because I only have half an hour." That will make you go down into the deep dark woods. You're gonna get lost. You're gonna lose all logical flow. You're gonna start repeating yourself, and you will break down. Or at least, your essay will break down, and you'll probably not even get a 4. So be careful. Why? Because brainstorming outline helps plan your attack. Where you're going to go. The ideas that you're going to come up with. And that's why allocating three minutes to it isn't a waste of time because once you have an idea, once you have mapped out what's going on, then the writing is going to flow out that much more smoothly. So that's the very first thing. Fundamental, brainstorm and outline. Then, start with thesis statement. Again, a thesis statement is your main idea. What are you gonna try to prove? Prove in your essay, your main idea or your main point. What are you going try to prove? Write it out. Then, here's the big thing. Write the body and examples of your essay. So why? Why what? Well, I skipped the intro. If you noticed, I said, just write a thesis statement. I didn't even say write the intro, and some of you may be balking thinking, "No, no, no. You have to write the intro. The intro's so important." But there's something that I call the perfect word syndrome, and many of us have suffered from this before. And the idea is, I'm going to write something. I'm going to sound very grand and important in those first couple of sentences, and I need to find that right word. No, that's not it. I'm going to go back. Now, I can say it like this. And guess what? 10 minutes go by, and you're still trying to write the perfect introduction. 10 minutes wasted. So skip the introduction from the beginning, and just start with the thesis. Go straight into the most important part, which is the body and the examples. That's what's going to back up your points here. This is going to take 20 minutes because again, this is really where you get to shine here because they're looking for analysis. They're looking for your ability to persuade them through your analysis. That's all happening right here. Finally, conclusion. It's minimal. It's not important. You're restating what you've already said before in your intro. Well, in this case, you haven't even had an intro yet, but the point is if you write your conclusion, you can use your thesis statement here and simply reword it. Reword your thesis statement. The conclusion does not have to be long. Reword. Maybe add one parting thought at the end. Two sentence conclusions are perfect. Even a one sentence conclusion is fine. And then, writing that intro, that first sentence or two, becomes easy because you've written everything else. There's no pressure. You've done all your persuading here. You've done a good job. That's approach number one, which I recommend for a lot of you if this rang a bell. If I said perfect word syndrome and you said, "Oh yeah, I know exactly what you're talking about", then this approach is for you. However, you may say, "Wait a second." Edit. Very important to edit and spend two minutes on editing. That is what's very important because as we talked about with grammar before, you do not want to make grammatical mistakes, and even worse yet, spelling mistakes. And that's why I spend two minutes making sure everything matches up and making sure that there's no smaller mistakes, and that's approach number one. And finally, that last approach we have here. It's very similar, and it's probably the common sense approach for many of you. But is it the approach that works? Well, you'll be able to answer that yourself. The key here is, again, no matter what, always do this first. But in this case, you can write your intro and thesis statement as you would normally. If you have no problem in doing this, you can usually get to the point after you brainstorm the outline, that is, you get to the body. Then, writing approach two or taking this approach is perfect, because I do not want to change the way you do something if you have no problems doing it. 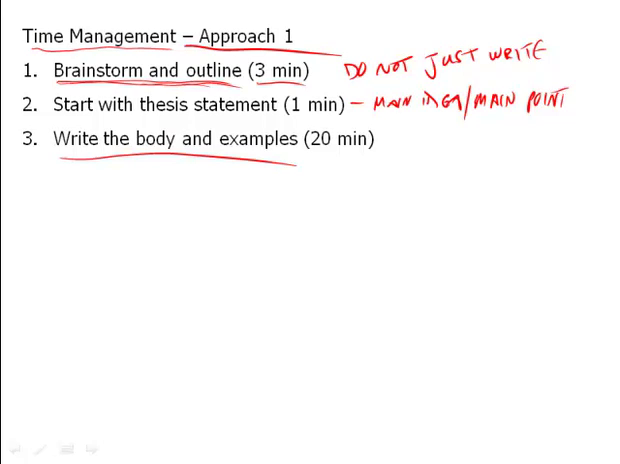 So if you're comfortable writing an intro and thesis statement, you can do it in three minutes. Then great.